It has been almost two weeks since we departed ATL for the BeachesMoms Social Media on the Sand conference at Beaches Turks and Caicos. I am desperately trying to cling to the "no problem" attitude and relaxation from being completely pampered by fantastic service. 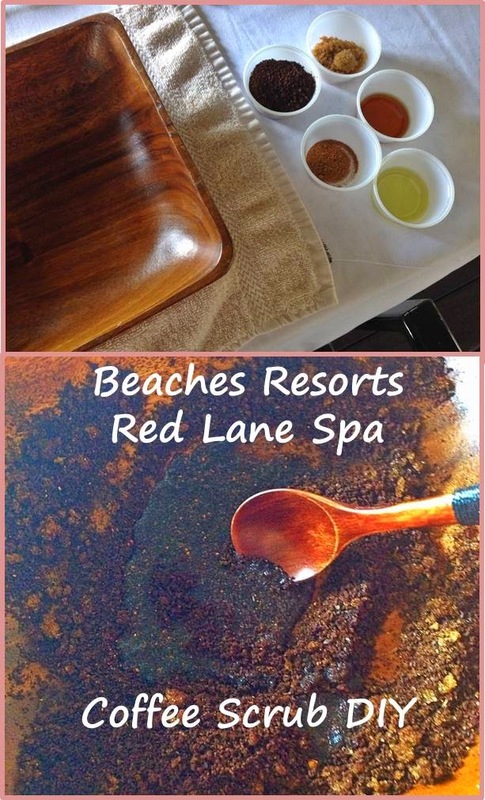 An aromatic body scrub in a warm bath may help... and it's a good thing that Beaches Resorts invited us to special DIY experiences over the conference weekend. I attended a DIY at the Beaches Red Lane Spa. Not only did they spoil us with a goody bag of luxurious spa products, they also taught us how to make our own body scrub at home with items from our pantry! Note: if you want a more vigorous scrub, you can use salt instead of brown sugar. But sugars melt faster and are more gentle on the skin. Mix together the coffee grounds, brown sugar, vanilla extract, and nutmeg (or cinnamon). Then add the oil by tablespoon until the scrub is of desired consistency. This scrub has a refreshing coffee aroma and works wonders on tired or dry skin. We scrubbed our hands with it at the DIY experience and wow, were we smooth! Thanks again, Beaches Resorts and Social Media on the Sand, for a relaxing, pampering, rewarding, and beautiful experience connecting with other social media moms (and a dad!) in paradise.